Experience the industry’s most comprehensive, fully-integrated Federal & California Tax Update. Led by renowned tax experts, Sharon Kreider and Karen Brosi, our Seminars, Live Webcasts and Self-Study Federal & California Tax Update options provide the information you need with flexibility and value that will maximize your time and money. Provide attendence verification at our live seminar and earn 16 CPE hours when you complete the course. Sharon and Karen are the best! I look forward to their annual tax update seminar each year. The class materials and lectures are essential for staying up to date each tax season. 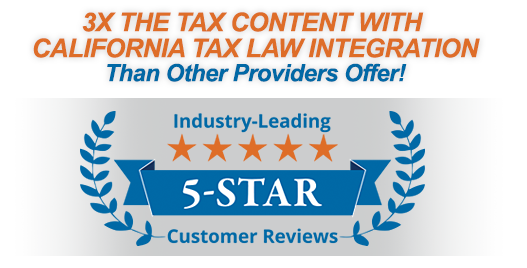 Identify important filing issues experienced by California taxpayers. Learn the details of how California doesn't conform with the new law. Receive a fully-linked, dynamic, PDF copy of our 2018-2019 Federal and California Tax Update Manual, when you purchase any Federal and California Tax Update course. This easy-to-use resource will support your success, not just in the course, but throughout the tax season.